Trailer For Can Hieronymus Merkin Ever Forget Mercy Humppe and Find True Happiness? Posted in Uncategorized | Comments Off on Trailer For Can Hieronymus Merkin Ever Forget Mercy Humppe and Find True Happiness? Is it just me, or is anything Vincent Canby hates this much worth seeing at least once in your life? In other words, don’s miss this cult classic! Plays May 1-7. Take the Money and Run plays as part of our year-long 1969 series May 1-7. 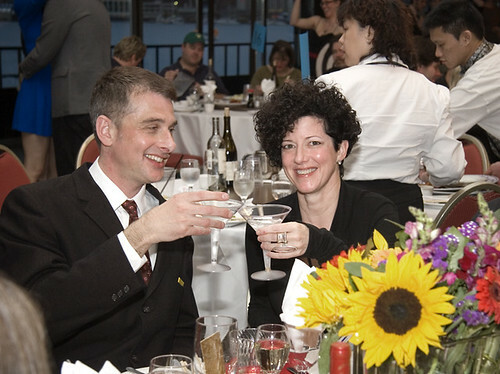 Visit out our Flickr page to see all the fun from our annual fundraising gala, held April 18. Thanks for Mark Sullo for the photos! Posted in Uncategorized | Comments Off on Gala photos posted! After releasing three films in four years, Iranian-American writer/director Ramin Bahrani has found critical adoration, not the least of which comes from Roger Ebert, who recently named him the new great American filmmaker. High praise indeed, but it’s easy to see why the world’s most famous movie critic has fallen so hard for Bahrani. All three of his films are fantastic, beginning with Man Push Cart in 2005, Chop Shop (my personal favorite of the three) in 2007, and now Goodbye Solo, having its area premiere at Northwest Film Forum this Wednesday, April 29 at 7 p.m. Tickets are still available here. Bahrani also will lead a master class on Tuesday, April 28 at 6 p.m., during which he will discuss the making of Chop Shop in detail. Through a set of seemingly disenfranchised characters, writer/director Bahrani uncovers the rich lives of those living on the edge in the contemporary United States. By working with non-actors and a small crew, he is able to capture an intense intimacy that borders on documentary. Born and raised in Winston-Salem, North Carolina (the setting for his most recent film, Goodbye Solo), he spent three years in his parents’ homeland of Iran while working on his thesis film for Columbia University, where he now teaches. His assured direction and original neorealist screenplays earned him accolades such as the “Someone to Watch” Award at the 2008 Independent Spirit Awards. Here’s an excerpt from a recent interview he gave in Minneapolis. Sometimes it’s weird. In the case of Chop Shop, I haven’t seen it in a long time—a couple years now. Me and my cinematographer Michael Simmonds and my co-writer [Bahareh Azimi] are pretty critical of our own work and try to find the mistakes: the things that work, the things that didn’t work, things that can be improved upon so that the next film can be a little better. At the same time, one of the things I like about Man Push Cart and Chop Shop is a film student could’ve made them, by which I mean there’s nothing extravagant about them. It just required a lot of hard work and some imagination. It’s within the grasp of somebody trying to make their first film in terms of the scope. Sometimes trying to make a film is quite frightening, and it should be because it’s quite hard, but when you eliminate Screen Actors Guild actors and you eliminate fancy camera moves and explosions—things that cost money. If you can have something simple, that’s very hard to do well, but it’s within reach. It’s very hard to make films that actually get bought and released, not just here but in other countries as well. So I feel quite lucky. Roger Ebert in America has been a huge help in terms of getting more people to see the films. And I’m also fortunate to have Goodbye Solo getting a much wider release then my previous films. You know Roger Ebert told me something very interesting about big and small films, which I really appreciated. With Man Push Cart he told someone in the audience that when he projects it on the big screen it’s as big a film as Mission: Impossible 3. I thought that was a very interesting comment. Your first two films took place in New York, but with Goodbye Solo you’ve moved the setting to your home town of Winston-Salem in North Carolina. Why the change? I think details are quite important to achieve something grander. You can see how precise details open up a world and hit you emotionally in terms of posing questions that we all feel deep inside us that are sometimes hard to articulate truthfully—as opposed to sentimentally or so explicitly that they can become mundane, which I think you can see in a lot of Hollywood films where they don’t really want to respect the audience. They want to explain everything to them. I think audiences are a lot smarter than that. Would you say Goodbye Solo is your most accessible film? I think so. My main collaborators and I have been talking since Man Push Cart about how we can maintain the rigor of cinema that we love as cinephiles so that cinephiles like you will still appreciate the films and we won’t feel like we betrayed anything we believe to be good cinema and art—and at the same time make films that our moms can enjoy, my whole family. What is a film that they will still enjoy, be engaged by, find emotional and moving? What will keep them in their seats so they want to know what happens in the end? There’s a lot of humor in Goodbye Solo. The first half is quite funny despite the serious subjects. This is something that is very important to me, that the films be accessible while at the same time maintaining that rigor. I found Goodbye Solo to be balanced in that it deals with some dark, depressing subject matter and themes such as suicide and loss of family—but yet it’s very uplifting, especially at the end. How did you strike that balance? That was always there from the beginning. From the conception we always knew the movie would see the glass half full—the way Solo does while still acknowledging that life is difficult, there are challenges, there is despair, there are people who have awful thoughts. I don’t like to think about suicide because it’s so awful, but I cannot close my eye to that reality. At the same time I believe that life and joy and hope is happening at the same moment, and this makes the ending more hopeful than a movie which only shows a kind of saccharine, cheesy, Hollywood feel-good ending. Each has its own origin. With Goodbye Solo, it was meeting a real-life cab driver who didn’t own his own cab. He had second job as a gas station attendant. This guy seemed like he could be an interesting character for a movie combined with this elderly man I had seen outside of an assisted living home in Winston-Salem every day standing on the side of the road alone. The movie was conceived at a time of great division in our country, and it seemed like we needed a character like Solo who could be so friendly to a stranger that by choice he is going so far out of his way to help him. One of the themes that [unites] all three [movies] is that they all [depict] working-class people. They’re working really hard to achieve their very important, if modest, dreams. These are dreams that may or may not happen, but they are struggling to pursue them with dignity, with honesty, with a smile, with a joke. I think that’s the majority of people. I’m sure most people live like this. It is hard living. That doesn’t have to mean a depressing, sad film. The words realism or working-class don’t have to equal boring, dark, depressing. In fact, Goodbye Solo [is] the farthest thing from that. That is very important to me, that not just cinephiles in New York City or in Paris like the film. No, I want people everywhere to like the film. I’m happy to hear you say that. Thank you. A few people told me with Goodbye Solo that they were so terrified I would ruin it in the end, and they were so happy that I did not. We worked very hard to really make the films emotionally truthful, that you would feel this is how it should happen; that it should not happen any other way. A lot of the time you see films where you feel like the screenwriter makes things happen to prove his or her point. I don’t want to do that. I want to try my hardest to know enough about life that wherever the film is going it’s something that with my collaborators we’ve uncovered truthfully. I think the job of the filmmaker is to remove himself, not to impose himself. It’s a strange paradox because the films are quite controlled. I’m obsessed with how every detail should be. I know it’s a contradiction, but so is life. Many offers came after Man Push Cart and I turned them all down not because I’m opposed to that, but because they just didn’t interest me. I’ve respectfully declined. Not that I don’t want to work on a larger scale or budget, I just don’t want to be compromised. I’m working on a western right now, which is a period film and will require a larger scale and budget. You’ll be seeing probably known actors in order to make it work. The Immaculate Conception of Little Dizzle is making the West Coast rounds! Director David Russo in attendance! “Huacho,” Alejandro Fernández Almendras (Chili/France/Germany). “Ordinary People,” Vladimir Perisic (Serbia/France). “Lost Persons Area,” Caroline Strubbe (Belgium). “Adieu Gary Cooper,” Nassim Amaouche (France). “Mal día para pescar” (“Bad Day to Go Fishing”), Alvaro Brechner (Uruguay/Spain). “Sirta la gal ba” (“Whisper with the Wind”), Shahram Alidi (Iraq). “Altiplano,” Peter Brosens and Jessica Woodworth (Belgium/Germany/Netherlands). “Noche adentro,” Pablo Lamar (Paraguay). 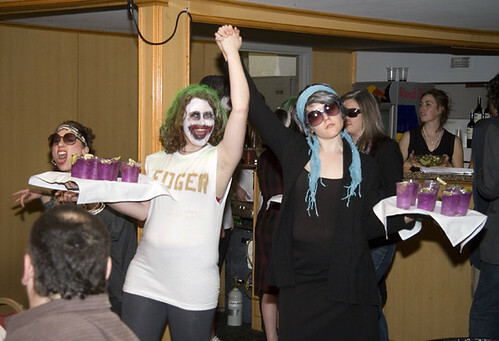 “C’est gratuit pour les filles,” Marie Amachoukeli and Claire Burger (France). “Tulum” (“La virée”), Dalibor Matanic (Croatia). “Logorama,” François Alaux, Hervé de Crécy, Ludovic Houplain (H5) (France). “Slitage” (“Seeds of the Fall”), Patrick Eklund (Sweden). Opening Night: “Rien de personnel,” Mathias Gokalp (France). Godfathers’s movie: “Hierro,” Gabe Ibañez (Spain). Closing Night: “La baie du renard,” Grégoire Colin (France) and “1989,” Camilo Matiz (Colombia). “6 Hours,” Moon Seong-hyeok (South Korea). “Les Miettes,” Pierre Pinaud (France). “Espalhadas pelo ar” (“Dispercées dans l’air”), Vera Egito (Brazil). Here’s a sneak peek at what’s coming up in NWFF’s summer calendar. We will be showing the new documentary Throw Down Your Heart on August 7-13, 2009. 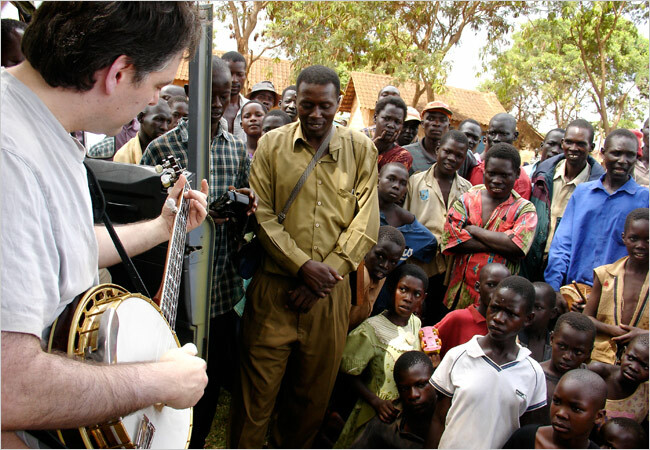 Award winning documentary Throw Down Your Heart follows banjo virtuoso Bela Fleck as he travels through Uganda, Tanzania, Gambia and Mali in search of the little known roots of his instrument and cross-cultural musical collaborations. A multiple Grammy-winner for jazz, bluegrass and classical recordings, Fleck suddenly finds himself a wide-eyed novice as he encounters a dizzying array of African languages and cultural traditions. But his musical conversations with both talented amateurs and international stars such as n’goni lutenist Bassekou Kouyate and Malian diva Oumou Sangare are testaments to music’s ability to connect people across superficial divides. Directed by emerging auteur (and Fleck’s younger brother) Sascha Paladino, Throw Down Your Heart is an enthralling journey and a moving celebration of music and humanity. At every stop on a journey that takes him from Uganda to Tanzania to Gambia and finally to Mali, Mr. Fleck plays and records with gifted local musicians. Early in the film, a Ugandan villager insists that the common perception of Africa as a continent ravaged by war and disease is “just a very small bit of what Africa is,” and “Throw Down Your Heart” sets out to prove him right. Mr. Fleck, a gentle, curious man of few words and formidable talents, is a benign presence. In a Ugandan village his banjo accompanies several local musicians playing a 12-foot xylophone. In Tanzania he collaborates with Anania Ngoliga, a master of the African thumb piano, an instrument consisting of metal tines of varying length attached to a wooden board. 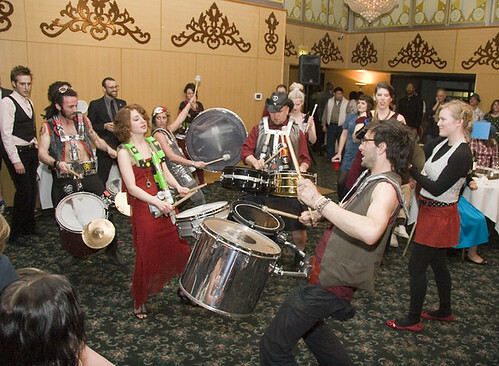 It is in Gambia that Mr. Fleck encounters the akonting, a primitive three-string forerunner of the banjo whose preservation is the mission of a troupe known as the Jatta Family. In Mali he meets and plays with the great guitarist Djelimady Tounkara and the diva Oumou Sangare, a national idol and phenomenally gifted composer and singer. When Ms. Sangare sings a heartbreaking lament of “a worried songbird” searching for her father, you don’t need to know the language to be gripped by the force of her cry. HUMPDAY IN THE FORTNIGHT AT CANNES! Congrats to Seattle filmmaker Lynn Shelton and her crew who are off to Cannes. Her latest HUMPDAY screens in the prestigious Director’s Fortnight, whose inaugural year we’re celebrating in our 69 series. A few years back Seattle filmmaker Rob Devor’s ZOO also took a bow in the Fortnight. Here’s a complete list of the this year’s Fortnight lineup. “Martin Manila,” directed by Adolfo Alix, Jr.